Thursday January 7th 1875. I rode part way to school this morning but walked home at night. I began a letter to Jane at school and finished it up after I came home. I wrote her ten pages. After supper us young folks all got ready and went to church. Will Reed came home with us and staid all night. Not quite as cold as it has been. 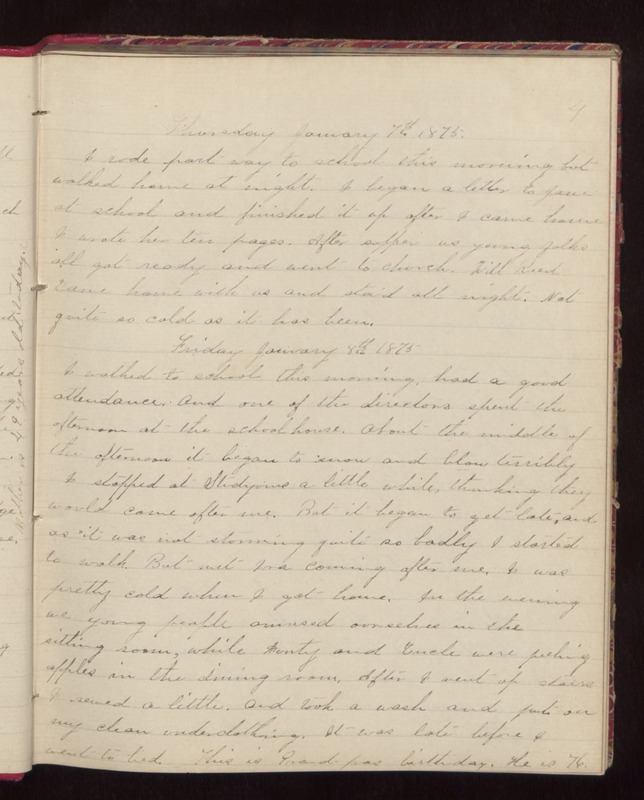 Friday January 8th 1875 I walked to school this morning. had a good attendance. And one of the directors spent the afternoon at the schoolhouse. About the middle of the afternoon it began to snow and blow terribly I stopped at [Studyvins?] a little while thinking they would come after me. But it began to get late, and as it was not storming quite so badly I started to walk. But met Ira coming after me. I was pretty cold when I got home. In the evening we young people amused ourselves in the sitting room, while Aunty and Uncle were peeling apples in the dining room. After I went up stairs I sewed a little and took a wash and put on my clean underclothing. It was late before I went to bed. This is Grandpa's birthday. He is 76.